Discover new opportunities with our simple bulk SMS platform. Start using our SMS broadcasting platform to reach huge audiences and make sure your message gets seen. Broadcast your message to thousands of people in a few clicks using our online bulk SMS platform. With an estimated open rate of 98%—SMS notifications are a great way to make sure your message gets seen. 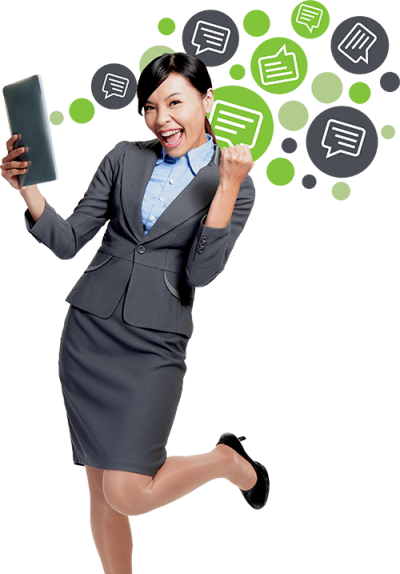 Try our online SMS platform and discover how effective bulk SMS can really be. Our online SMS pricing is designed for versatility and scalability with a range of send credits packages to suit different volumes. Our send credits never expire so you can use them whenever you need. SMS messages to standard Australian mobiles are 1.15 credits per 160 characters. You can use our online SMS service to send appointment reminders, SMS verifications, SMS marketing—and a range of other bulk SMS broadcasts. If you are sending out SMS marketing ensure your SMS is complaint with the SPAM act 2003 and include a clear opt-out message. How to send SMS online with GoFax. Login to your account online and send bulk SMS via your browser. Setup your email to SMS service and send bulk SMS from your email. Download the desktop software to send bulk SMS using the app. Developers can connect to our API and SMS with other software. Our bulk SMS service can broadcast your messages worldwide with global SMS coverage and virtual numbers in over 50 countries. Send bulk SMS to standard Australian mobile phone numbers for 1.15 GoFax send credits per 160 character SMS. Contact us to request international pricing.